I wanted to come up with a cake recipe for special celebrations, whether it is a birthday or an anniversary. Or just to celebrate the fact that it’s a Wednesday – really any reason will do. 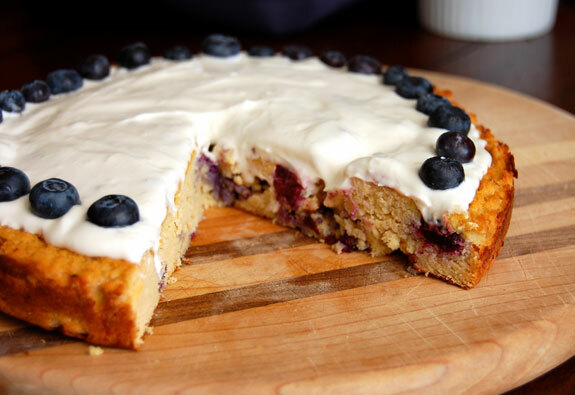 This blueberry lemon cake is a bright and flavorful dessert. You could split up the batter from this recipe to make cupcakes or smaller individual cakes as well. The cake is mainly made with coconut flour, which adds its own sweetness. Start by greasing an 8-inch cake pan very generously with coconut oil. This is to prevent the cake from sticking to the bottom and sides of the pan when you try to flip it out later. 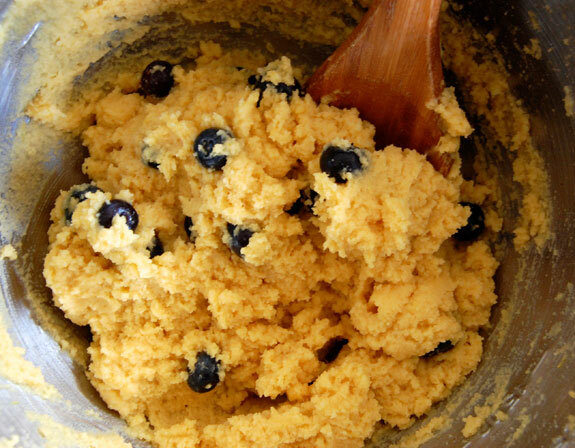 After stirring the dry and wet ingredients together, fold the blueberries into the batter. 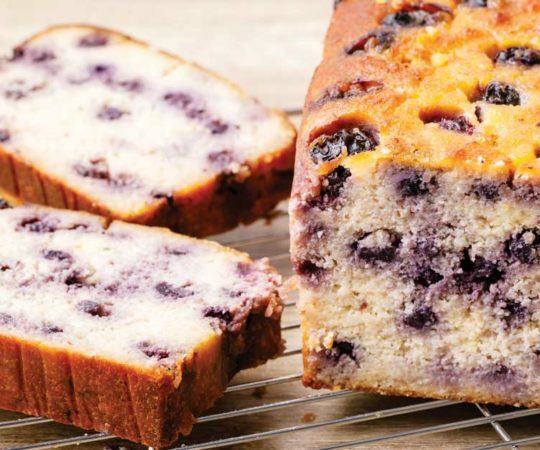 This creates lovely pops of tart blueberry flavor throughout each slice of cake. Once the cake is done baking and has turned golden brown, allow it to cool before trying to flip it out of the pan. You could of course also serve it straight from the pan. After loosening the sides of the cake with a spatula, I flipped mine out onto a flat baking sheet. If any pieces do stick to the pan, simply remove them with a metal spatula and fit them back onto the cake. The really great part about frosting is that you can cover any blemishes on the cake with it. For the frosting, either use a blender or hand mixer in order to evenly combine the flavors. It’s important to taste the frosting and adjust the ingredients so that it doesn’t come out too sweet for the already sweet and tart cake. 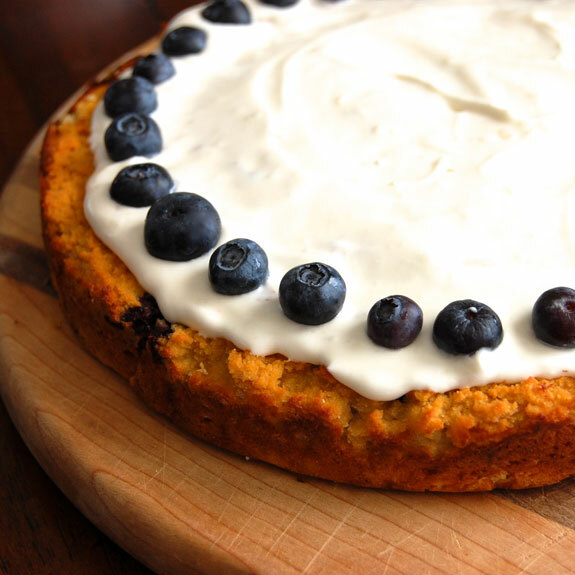 Blueberries and lemons are one of my favorite combinations for cakes or cupcakes, along with poppy seeds. Maybe next time some poppy seeds will make their way into this cake recipe, but for now it was perfectly delicious as it was. 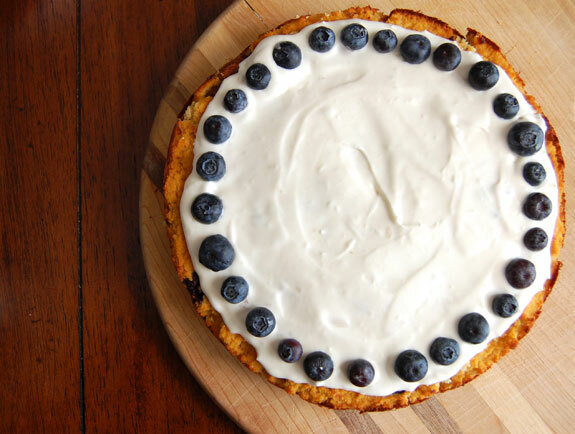 Celebrate any special day is with this delightful blueberry lemon cake. Preheat the oven to 350 degrees F. Coat an 8-inch baking pan generously with coconut oil. Combine the coconut flour, baking soda, and salt together in a small bowl. In a separate large bowl, mix together the eggs, almond milk, honey, vanilla, lemon juice, and lemon zest. Add in the coconut flour mixture and stir well to combine. Gently fold in the blueberries. Pour the cake batter into the prepared baking pan. Bake for 30-40 minutes, until golden brown and a toothpick inserted into the center comes out clean. Allow to cool completely on a wire rack before carefully flipping out of the pan. While the cake cools, blend together the coconut cream, lemon juice, vanilla, and honey until completely combined. Spread in an even layer on top of the cakes (once they have been flipped out of the pan). 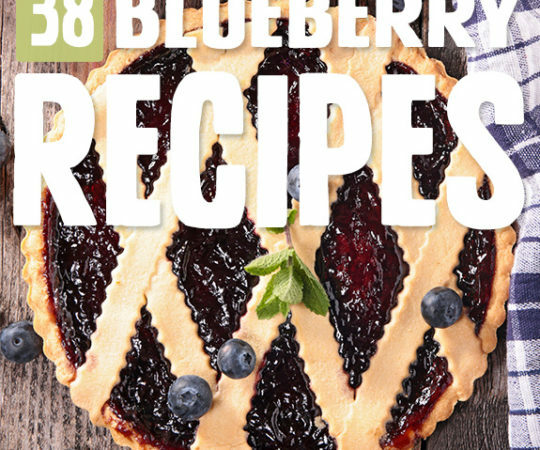 Top with additional blueberries if desired. That’s great to hear!! If you are new to Paleo cooking, your instincts sound great about adding more moisture to the cake if the batter doesn’t look right. Glad that everyone enjoyed it! Easy and very moist! Worth making, yum! This looks so yummy! Going to be making this one! Rebecca doesn’t explain very well re: the icing. Place the tin of coconut cream in the fridge till cold, then open and scoop off the set coconut cream portion. 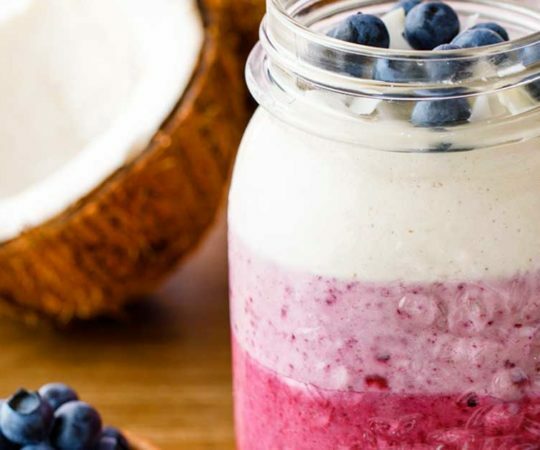 Reserve the coconut water for smoothies. Use only the white cream in the icing. Just made this cake. I was a bit surprised to see no shortening in the ingredients…but went with it anyway. Doubled the quantities to fit an 8″ square pan. Substituted half of the coconut flour with shredded coconut and almond meal for a toastier/nuttier flavour. Yum! Does doubling the quantities from what she suggests for an 8″round to an 8″ square mean that the cake is less shallow and takes longer to cook? My issue exactly, Tricia. Coconut cream is hard as a rock! I just wrote a comment on here to that effect. What everyone else (besides me) is using is the “cream” off of a can of coconut MILK. Big BIG difference! My daughter and I love the sound of this recipe, but she is off lemons at the moment. Does it need the liquid or can we just omit them (I know it won’t have the tartness, but that’s okay). Thanks! Looks & sounds delicious. Will it work if I sub chia eggs for the eggs? This recipe did not work out for me. I had to bake the cake for 12 mins longer to get the center to set, and by then the edges were overcooked. Also, the “frosting” was more of a watery whipped cream texture. I tried thickening it with coconut butter and it broke. Expensive recipe fail! Is there any reason not to use baking paper? Is the batter meant to very liquid? 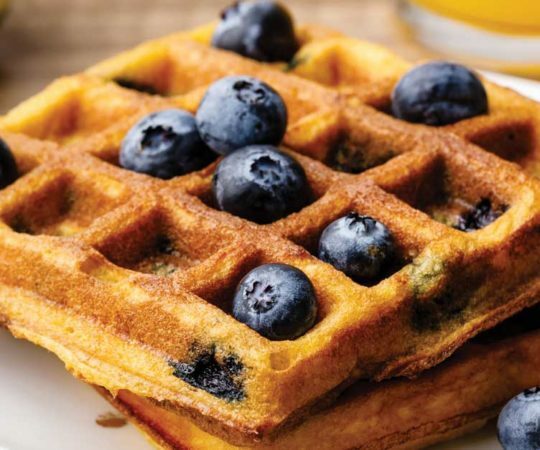 I often find paleo batter to be very runny as it thickens with all the eggs as it cooks but this recipe is the most watery I have found yet and 2/3 cup coconut flour seems very little in proportion to all the liquid ingredients. Can’t decide whether to put it in the oven and hope for the best or add more flour…. What did you do? I made this today, realized the batter was way too liquid, and then added a couple of couple of almond flour to make it the right consistency. The cake itself is a bit heavy … but 2/3rds of a cup of coconut flour with 5 eggs can’t be right! Perhaps she means 2-3 cups? Is there supposed to be some kind of fat (ie. coconut oil) in the cake? Usually there needs to be for it to be able to bind together. Made this for desert and I just poured topping over after it was plated out. Everyone throughly enjoyed it. No problems with cake recipe – thank you! Can maple syrup be substituted for the honey? I find honey makes baked goods cook too fast and gets it over done…anyone try that yet? I used Maple Syrup and it worked just fine! Can. 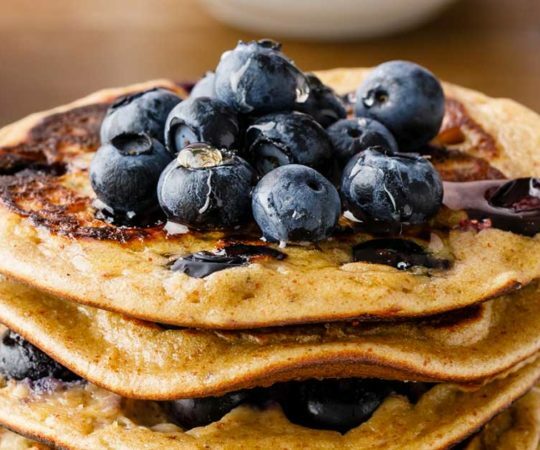 Substitute almond flour for the coconut flour? And how much? This an AMAZING recipe! Mine was dry as I added last tablespoon of coconut flour. I used plant protein milk by Bolthouse farms. I cooked these as muffin tops rather than a cake and skipped the icing. 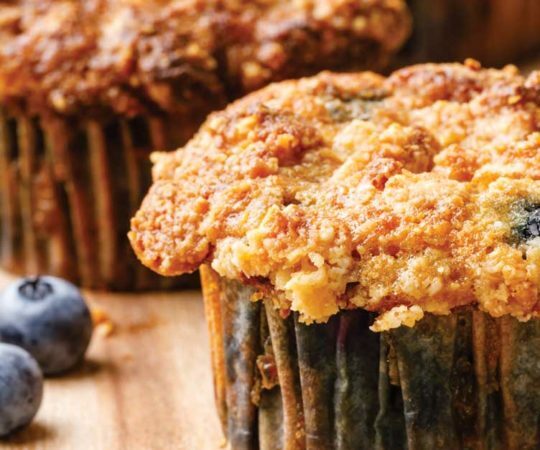 These will make a FANTASTIC on the run breakfast or lunch addition! !